Last Saturday, I met up with both Mr Noodles and Gourmet Chick at Dragon Palace in Earls Court; Mr Noodles had organised for us to meet over an excellent dim sum lunch. When he suggested it originally, the name of the restaurant seemed strangely familiar to me and it soon transpired why – I used to live near Earl’s Court and the restaurant has been sitting there in front of the tube station for years. I even ate there one a very long time ago and I remembered that it wasn’t very good; we used to frequent another local Chinese restaurant instead but since then, that place has become an estate agent. Dragon Palace’s current website says that the management has changed since then and the menu definitely looked different and actually quite inviting. While I was looking forward to the lunch, I couldn’t help but be a little bit wary still; luckily, my fears all came to nothing. It was a chilly day when we lunched and the warm and cosy restaurant was packed; Mr Noodles had made a reservation beforehand and I would recommend it to anyone heading there for dim sum. The dim sum menu wasn’t very long but it was illustrated which definitely helped in the selection of dishes; don’t you hate it when a lot of the dishes are given different English names at different restaurants? It helps to see what you’re ordering! Our selections were all ticked off on the order form and we sat back and waited for our lunch to appear. First to arrive was this trio of steamed dumplings: Prawn Dumplings (aka Har Gow, £2.50), Scallop and Prawn Dumplings (£2.60), and Village Dumplings (£2.50). These all gave a good first impression to the restaurant; both the prawn dumplings and scallop and prawn dumplings were generously filled with big flavourful prawns. The village dumpling (with the chive tie) was delicious with its sticky and chewy wrapping and thick, saucy fish filling. The Turnip Paste w/Wind-Dried Meat (£2.20) were well made with lots of shredded daikon radish. 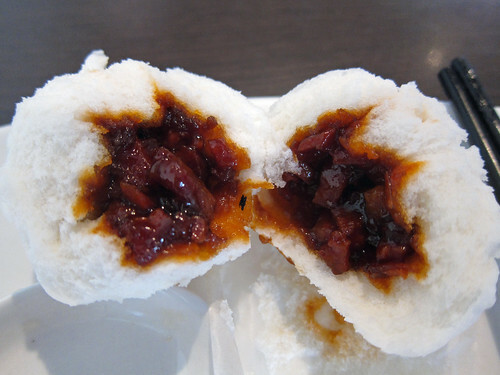 The Honey Roast Pork Buns (char siu baos, £2.20) were also very good. 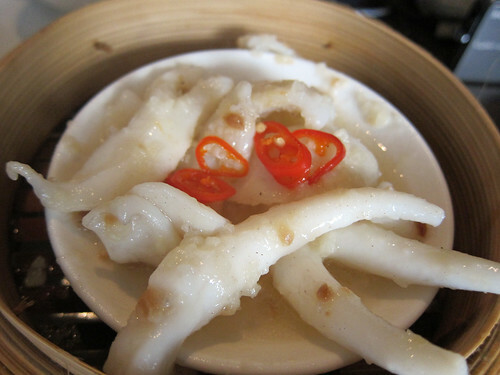 A more unusual offering was the Steamed Squid and Garlic (£2.20). The squid itself wasn’t bad (though I still prefer the more usual deep fried squid) but the garlic sauce smothering the tentacles was wonderful and full of well…. garlic. Pan-fried Dried Shrimp Cheung Fun (£2.20) made for a bit of a change from the usual steamed cheung fun. They were smaller, tightly rolled up sheets of rice noodle pan fried, which forms a bit of a crust on the outside that’s both ever so slightly chewy and good. 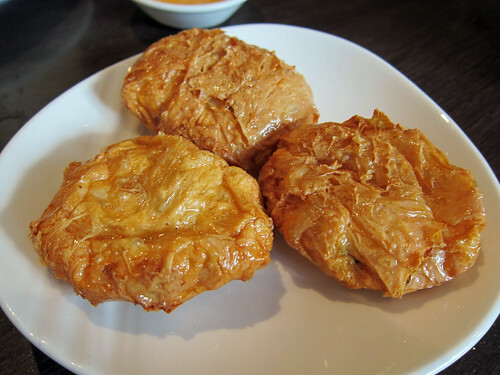 The fried Squid Cakes (£2.30) were unidentifiable at first due to their wrapping of bean curd skin which had become very crispy after frying. 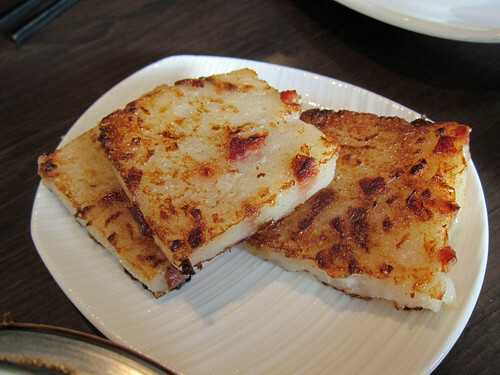 The squid cake inside was a good tender/bouncy texture. After the large portions of everything that came before, the Yam Croquettes (£2.40) came out looking positively minute. Luckily, they were excellent with a tasty meaty filling and not too thick yam coating; they were even freshly fried! Apart from the dim sum, there was the main reason we were here – silver needle noodles – a noodle that none of us had encountered anywhere else in London but that Mr Noodles discovered this restaurant served. They aren’t literally silver, of course, but a translucent, short, tapered-ended noodle made of rice flour that also known as rat’s tail noodles. Rather impressively, they make them in-house (which I think all the dim sum is too). 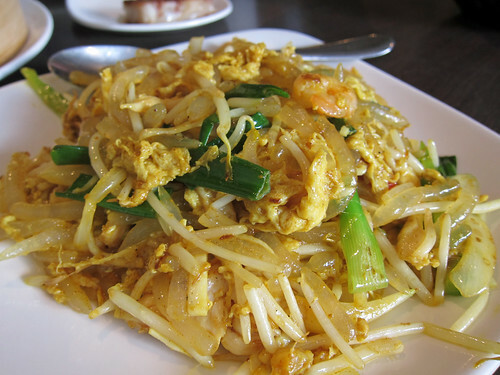 We ordered them Singapore style, so stir fried with plenty of curry powder, bean sprouts, eggs, onions, peppers and shrimps (£5.80). 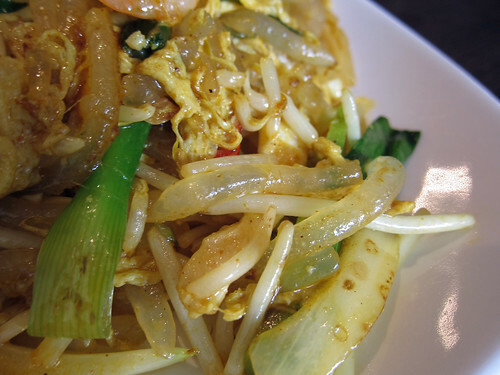 The noodles were lovely – all soft and quite pleasingly shaped like earthworms. But we weren’t finished with the dim sum! 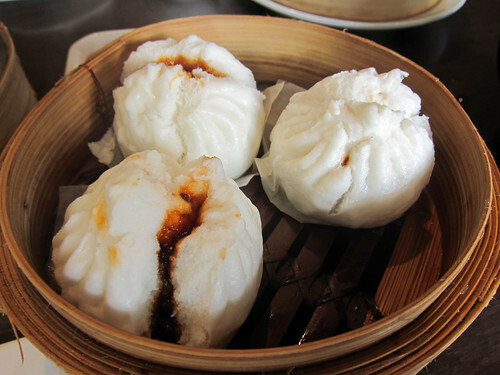 Every weekend, the restaurant offers two special dim sum dishes. Due to a bit of a mixup, we received the sweet Special B – Pan fried pancake with red bean paste (£3.20) instead of the savoury one. I opted to keep it as it had been a while since I had this treat. While not the best rendition I’ve ever had, this pancake was still very good, with a very generous filling of red bean paste. The savoury Special A – Steamed Pork Belly & Taro Bun (£3.20) did make our way to the table after this. 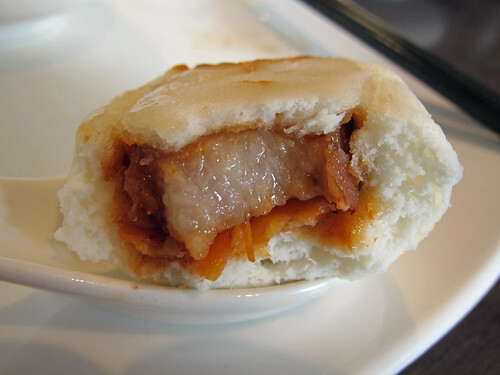 A thick slice of pork belly and a much thinner one of taro were nestled within the bun, making for quite luscious eating. Maybe too luscious – I wish my bit of pork belly had a bit more meat and bit less fat and that the taro slice was thicker to balance against the flavour and texture of the pork belly. Still, not bad for a weekend special dim sum dish; it looks like both specials change each weekend. With tea and service, the bill worked out to only £14 a head – a real bargain for dim sum as we were so so full after the meal. The dim sum here is all excellent and while not as refined as some of the fancier places in London, the flavour certainly doesn’t suffer. What a wonderful place; I can certainly see myself visiting again. Thank you again, Mr Noodles (and his post on the meal, with the Chinese names of the dim sum dishes!, is here), for organising this lovely lunch! Oh my god the extreme envy. While I have to make my own, inferior dumplings, in London you have your pick of places…Know what you mean about wishing for more meat, less fat – I often feel the same. I wish we had more dim sum places around here…what you had looked excellent! That sounds delicious especially the yam croquettes which is a favourite of mine along with pork and prawn siu mai (sic?). The place seems to be a bargain as well. Sounds like a very interesting quality price ratio ! nice pictures, really nice ! I must admit that I was a tad apprehensive given that the last time we ate together wasn’t entirely successful (No.10 Chinese Restaurant, funnily enough also in Earl’s Court!). So it was with great relief that it was such a fine lunch! Whilst there are better dim sum joints in London, you’ll struggle to find better for the bargainous prices at Dragon Palace. A great find – even if I say so myself! Never seen taro and pork belly in a bun before, only in the steamed dish. thank you for this extensive introduction to the world of dim sum! 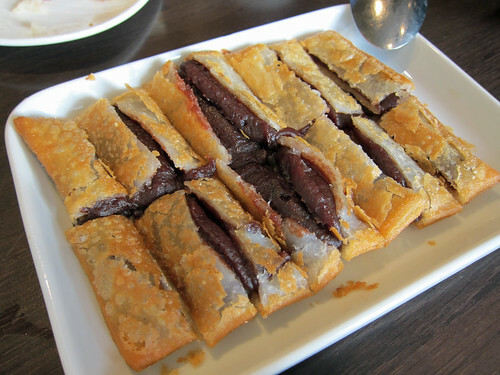 Great write up – I really enjoyed our meal – particularly the rats tail noodles, I leave the red bean paste to you though! 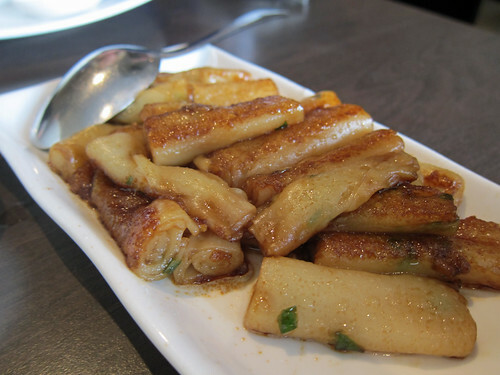 I can’t tell you how much I want pan fried cheung fun. I just can’t. This looks really good, loads of dishes I haven’t tried before. The pan fried cheung fun looks amazing and so do (my favourite) pork buns. and so cheap! Sasa: I’m not always like that about fat but I do believe I tucked into a proper chunk of lard that day! 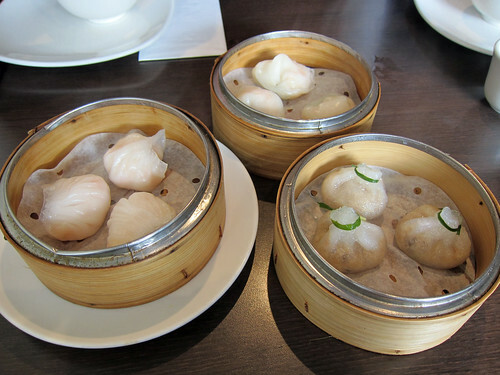 kat: Such a shame that dim sum is not so popular around you! Robert: Yeah, strangely, we didn’t have any siu mai this time… that and har gow always must be included in a lot of our dim sum feeds! Antonio: Definitely – their stuff is very very good, especially for the price. Mr Noodles: Thank you so much for finding this place. Such a good find for the area! Joshua: I guess (and I hope) that they do these experiments on the weekends? 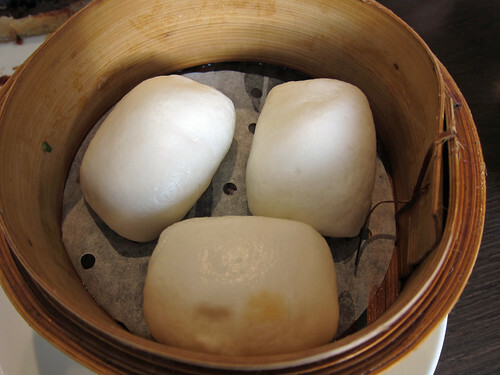 I would be interested to know what other interesting dim sum dishes they come up with. ilse: Oh, you’re so kind! Next time you’re in London, give me a shout and we’ll go for dim sum together! S Lloyd: Uh oh. I honestly cannot give you an answer as I’m guessing that some of the best would be in Hong Kong and I’ve yet to visit. There are some excellent ones in Vancouver/Richmond in Canada though. Gourmet Chick: 😀 More for me! Helen: I can imagine it. I certainly can. What a great selection of dishes! I’ve never had fried cheung fan before. Foodycat: Frying it gives such a wonderful texture – slightly crisp, slightly chewy – all good! 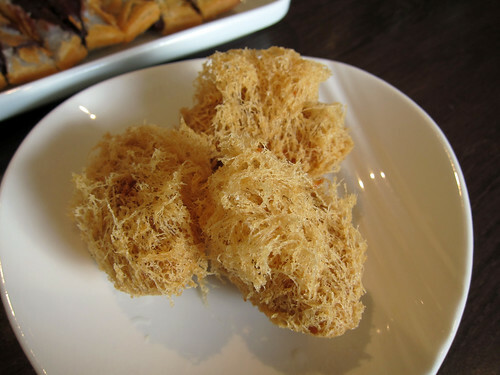 The fried cheung fun looks awesome! This is my local Chinese restaurant and I go there almost every Sunday for the most delicious Dim Sum. I have probably gone there more than 60 times by now, with various people, and I never, every had a bad meal. Consistent, fresh, generous, often imaginative and often delicate (especially their specials) and great value. I am proud to say that when I started going there, very few people knew about it, but now it is getting busier and busier with lots of Chinese people. But hey, don’t tell to everyone, otherwise I won’t be able to get a table! Yes, they do, Joshua. Their chef really is a keeper, the guy comes up with the most exquisite specials, sometimes deserts, too. I believe that they make a couple of new things every Sunday and some of these things were so delicate, refined and sumptuous that I salivate when I think of them. By the way, their staff is great, too. They have been there for years, nice to see the place that manages to keep their waiting staff. 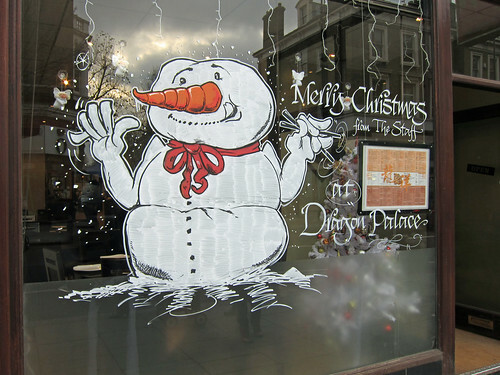 Earls Court is lucky to have Dragon Palace, I hope the chef never leaves, lol.